← Yeah, I went there. Sometimes, even in the dead heat of summer, you crave something that is more suitable for winter. Most comfort foods are cold weather foods, it seems…and you need to be comforted year round, right? This meal is one of the simplest and although it requires turning the oven on, you’ll barely be in the kitchen long enough to break a sweat. It’s perfect for the days when you just don’t feel like grilling, or when you long for something that reminds you of two feet of snow (in a moment of temporary insanity). Although, there is one part of this that screams summertime…the fresh parsley from my garden 🙂 It definitely gives it a lighter, fresher taste. And next to taste, the best part of this meal is the cost. Seriously, it doesn’t get much cheaper than this. Put all ingredients in a large Ziploc bag and let marinate for at least 2 hours. Preheat oven to 375 degrees. 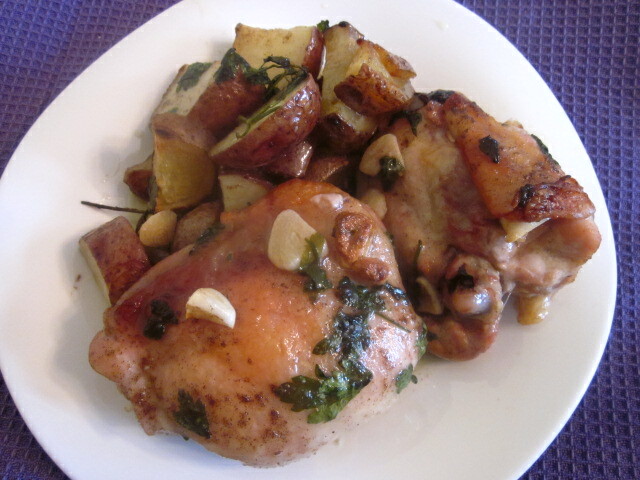 Place chicken mixture in a 9×13 pan and bake for approximately 45 minutes. Let rest for 5 minutes before serving. This entry was posted in chicken, garlic, main dishes, make ahead, potatoes, QuickAndEasy. Bookmark the permalink. 2 Responses to Longing for December? This really looks delicious, Melissa. I’m a big fan of any food, any season, so to see a good baked chicken recipe, even in the summer, works just fine in my book. Thank you for sharing this! That sounds delicious! I’m a big fan of one-pan roasted meals…such easy clean-up.